The Waterworks Museum at Hereford is quite unique and tells you the story of drinking water whether you just have a general interest, enjoy social history, love seeing big engines working or your kids simply want to have fun while they learn. The Waterworks Museum has the widest range of pumping engines working on one site in Britain. From the beam engines of the Industrial Revolution to the most modern electric submersible pumps you can see steam, hot-air, gas, diesel and petrol engines working from every era. 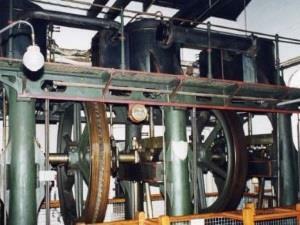 The Museum hosts the oldest triple-expansion steam engine working in Britain. It stands two floors high and is quite awesome in operation. Add to the list wind and water powered pumps, overshot water wheel and turbines, and you begin to appreciate the incredible range of the collection. But if you are not interested in engines then just stay a while and enjoy the lovely grounds of the Museum which stand close by the beautiful River Wye. The main building was the Victorian water pumping station for Hereford City and dates from 1856. It is a splendid example of the architecture of the period and is not only Listed but also a Scheduled Monument. The interior has been maintained as it would have been in its heyday. The Museum is classified as a ‘site of clear national importance’. In a phrase, ‘have a wonderful time’ and learn about water at the same time. Little ones can do colouring and brass-rubbing as well as try the dressing-up box. Primary kids can do trails and operate all sorts of pumps, interactives and replica water lifters from 2000 years ago. Older ones have an Engineering Trail and make model engines work. Trail completion always earns a badge! They can all let off steam in the grounds, make water splash, see massive engines working, as well as have all their questions answered. There are special children’s days every half-term and in the summer holidays: look for them on the Museum website. After seeing the exhibits what you need is rest and recuperation! Pop in to the Visitor Centre for the best cuppa in Hereford. If the weather is fine take your refreshments out to one of the picnic tables and enjoy the soft murmur of the water garden with its lilies and mayflies. Every year there are exciting events (see website) including Gala Day in July with its historic vehicle cavalcade and the national Stirling Engine Rally in the autumn. The whole Museum is accessible to disabled visitors. We look forward to seeing you. The Waterworks Museum is open on Tuesdays and is in-steam with engines working on 18 days during the summer season (see website) but also welcomes group visits and school visits (by prior arrangement) throughout the year. Group prices are governed by the size of the group. School visits are free of charge. The Museum is wholly operated by Volunteers. This means that group visits and private bookings will only be accepted once we have established that we have sufficient Volunteers available to receive visitors safely.